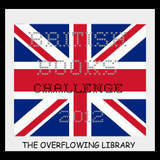 We are now onto the penultimate month of the 2012 British Books Challenge. How close are you all to completing?? November's Prize Pack will be coming from Nosy Crow and is sure to be a treat. Please link your reviews for a chance of winning! I've linked up a few of my reviews for this month. Well I've passed my target for 50 reviews! P.S. K.J. Parker is a mysterious author - no-one knows who he/she is - but they do definitely live in Britain, so I think it counts.